Your kitchen is the one room in the home that gets the most foot traffic. It’s where family and friends go to eat, socialize and relax. The kitchen has the ability to bring people together and keep everyone coming back for more. It’s possible you’ve looked around your space lately and realized it needs a few updates. There are many different ways to improve the appearance of your kitchen. Fall back in love with your kitchen by making changes that are going to enhance the look and feel instantly. Put time into researching your options and deciding what’s best for you. See 10 steps to an even better kitchen. Take a good look at your floors and see if they need replacing or refinishing. Kitchen floors have the ability to make or break the space. They set the tone for how the rest of the room comes together. Consider if your goal is to brighten the space, modernize it or both. Discover if you’re someone who prefers tile or hardwood. Remember to take into account what the upkeep requirements are for each material. This is also your chance to try a new type of flooring and completely change the look of your kitchen for the better. Many homeowners forget about adding a backsplash. This is an easy and budget-friendly way to add a surprise element without going overboard. There are lots of different colors and styles to choose from. You can add a backsplash to an entire wall or a tasteful border around the kitchen. Take a look at your options and what may be a good fit. A backsplash will catch your eye when you walk in the room and make your kitchen look super fancy. Look at examples of other kitchens to narrow down possibilities for your own. It’ll take a plain space from drab to fab in no time. It’s easy to clean and maintain and adds a personal touch to your space. There’s really no downside to installing a backsplash in your kitchen. Roll your sleeves up and organize your kitchen cabinets and drawers. Get rid of or donate what you no longer need or want. Do a deep clean of the insides of your space and make it look brand new again. Use drawer dividers and install any necessary pull out drawers that make your life easier. Organizing your belongings will have you better maneuvering in the kitchen, and you’ll be able to find your items faster. If there’s no room for pots or pans, get a hook and hang them on the ceiling or wall. Get creative as you shift your belongings around and purge what you don’t need. Store measuring cups and spoons in a cute jar on the corner or magnetize your spices and hang them on the back of the door. There are lots of tools out there to help you get the look you’re going for and feel more put together. If you don’t already have one, build a breakfast nook in your kitchen to add charm. They’re great for eating breakfast, reading and using as an extra space for the kids to do their homework. A breakfast nook adds value to your home and elegance to your current space. Style it to your liking with beautiful chairs or benches and a unique table. Install shelving behind the bench to store cookbooks or other personalized items. Add an area rug, pictures and fresh flowers to the space to freshen it up. Build it against a wall of windows and soak up the natural sunlight all day long. Throw some pillows on the bench, and you’ll never want to leave. An island is a staple in the kitchen. People love them because they add extra seating, a countertop and storage to a favorite place in the home. There are roll away or permanent islands, depending on your space and preference. Fill the cabinets with your belongings and add a few tall benches for people to sit on. An island is also useful for preparing or serving food. They’re the centerpiece for your kitchen and an addition most homeowners can’t live without. Another idea is to have your island function as your stove, add a sink or refrigerator drawers. The possibilities are endless. You never want your kitchen looking dreary or dark, unless it’s shut down for the night. This is why it’s important to install various lighting options in your space. Think about where you’ll be cooking, serving and cleaning up. The kitchen is one area you want nice and bright during busy times of the day. 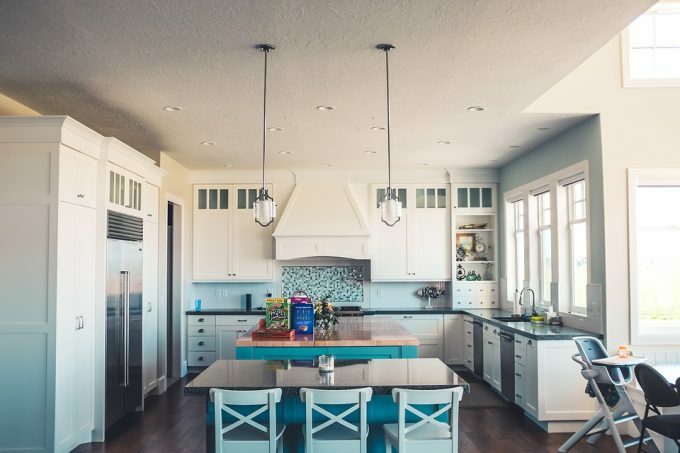 Consider how much natural light your kitchen draws when debating lighting solutions. Use recessed lighting, pendants and a ceiling light for variety. Also, be sure to include some lights on a dimmer switch so you can easily set the mood for whatever the occasion or time of day. Lighting is key to your success in the kitchen. Give yourself options and use the natural light to your advantage. Instead of leaving your windows bare, dress them up with window treatments. Think about blinds, shades and drapes to add style to your kitchen. Pick colors that complement the rest of the space and that you enjoy looking at each day. You’ll be pleasantly surprised how window treatments will lift the spirits in your kitchen and make it look more put together. They don’t need to be expensive to look pleasant. You can choose from designs that already exist or work with a professional to custom design your own. It’ll depend on the shape and size of your window and the overall interior design concept. Be open to suggestions and ideas you hadn’t thought of before. It’s important always to keep your kitchen clean. Not only because it looks nicer, but also for health reasons. There are food particles and dirt consistently roaming around. If you do get ants, it’s important to call the professionals at Lake Norman Pest Control. They’re trained and certified to help you with your pest problem and immediately take care of the issue. Not only do the pest control technicians provide a variety of safe, effective extermination services, but they also take the time to offer expert advice on the best way to keep ants, termites, mosquitoes, bed bugs and a number of other unwanted pests out of your home for good. Cleaning regularly will help prevent such incidents, but sometimes it’s out of your control. You don’t have to live with pests, and that’s why the experts are available to help. Get inspired to decorate your space and not leave it plain and boring. Unpack your boxes of décor and determine what will look best in your kitchen. If you don’t have what you want, go out shopping and grab a few new pieces. Add pictures, fruit bowls and decorative bowls and vases to keep it looking unique and inviting. It doesn’t take much to make it look more like home. There’s no need to overdo the decorations and add clutter to your countertops. Keep it tasteful and attractive. Hang cute decorative pictures on the wall and adorable dish towels on your stove handle. Include a wine rack if you have room or a rug at the patio door. Incorporate a pop of color on your walls, countertop or around your kitchen island. Tiered shelving is also a good way to save on space and display decorative dishes. Include jars on your countertop filled with dried pasta or other attractive fillers. The simplest way to update your cabinets, without needing to replace them entirely, is to update the hardware. Purchase new and modern handles that freshen up the space and instantly update the look of your cabinets. It’s an easy and painless project for you to complete. You’ll love the change and be glad you took the time to replace the handles. It’s a great way to buy yourself some time before you have to purchase new cabinets. Another idea is to paint the cabinets you have, instead of replacing them. Paint is a budget-friendly project that will offer you up any look you desire. Use a color you’ve always wanted in the kitchen or go for a neutral look that mutes what you already have installed. Your kitchen is one room in the house you can’t live without. There’s so much that goes on in the space. It’s no wonder you want it to be perfect. Instead of stressing about what yours currently looks like, find options for improving the look and getting it to a place you adore. You don’t have to complete every single update at once. Picking and choosing a few improvements will put you in a good place. You can always add on as time passes. These are 10 steps to an even better kitchen.